Focus on this kind of scene to dispel some of July’s heat and frustration. What a relief it can be to learn that your best response to many of summer’s garden woes is to do nothing but make future plans. In July it can be oppressively humid. As the heat takes its toll and frustration sets in, let’s look at some common summer garden problems. Holes in hostas are history. Most of the damage you see in July took place months ago when that foliage was cool and new. 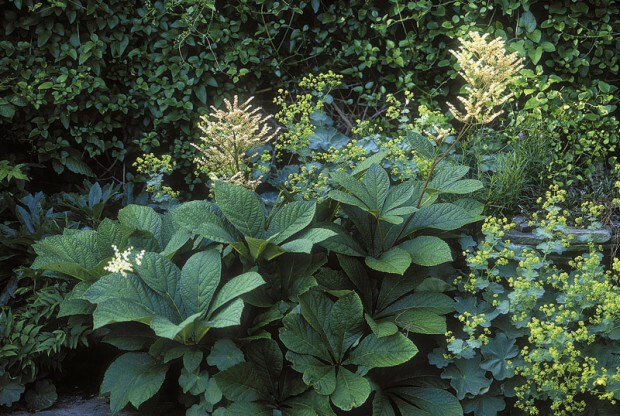 As bad as your hostas may look, the condition is far from fatal. The plants have had plenty of time in the sun to photosynthesize all the sugars and starches they need for the year plus sock away the surplus for next spring. In between holes, they still have lots of leaf surface left to keep on banking starches right into fall. Holes in hostas are history. Do nothing now. Next spring is when you can act to head off the damage next year. Whatever you do, don’t put out little saucers of beer now, even though it’s true that they will attract and drown slugs. The time to deal with that slug problem is next spring. Then, clear away all the mulch and other plant debris from slug-riddled areas. Leave the soil surface naked and dry. 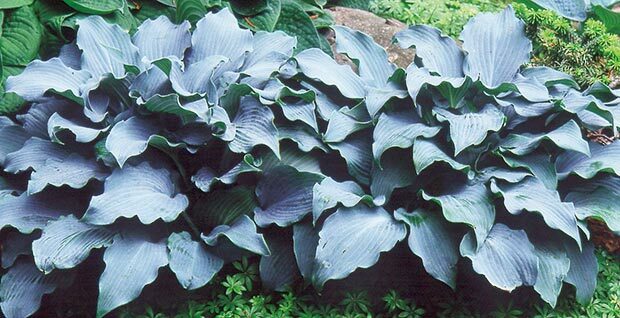 While hostas and other plants are emerging, during the last half of April and first half of May, set out slug traps. Beer traps are fine, but wetted sections of newspaper are at least as good, and they’re far less messy. Just lay them down in the morning near the first hosta shoots, then flip them over before the sun goes down and kill the slugs you find hiding there. They hide there because you took away all the other places where they might have escaped the sun. Dispatching a hundred slugs in April is more productive and far less smelly than drowning a thousand in July. What goes down will come back up. Eye-cooling lobelia, pansies, verbena and some other annuals have the habit of opening one last flower on the fourth of July then stretching out to give dirty sweat socks a run for the “Most Ugly” title. 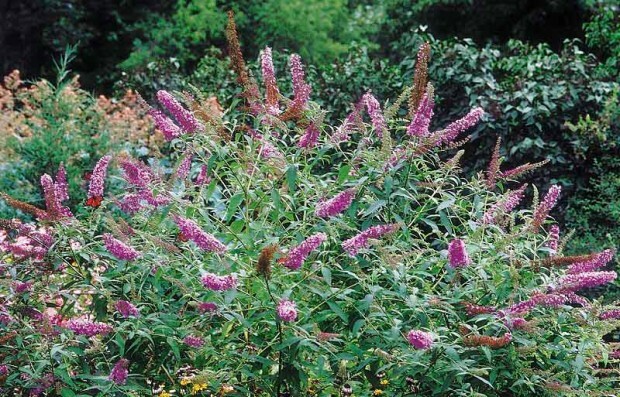 They can be made a bit neater in July but will rarely resume blooming until mid- or late August. That’s because it’s too hot at night. So chemicals that would be created within the plant’s cells while it’s cool and dark don’t form. Those chemicals provide the only nudge that can make the plant produce new flowers. Without their chemical cues, the plants sit out July—green, seedy and waiting. What goes down will come back up. 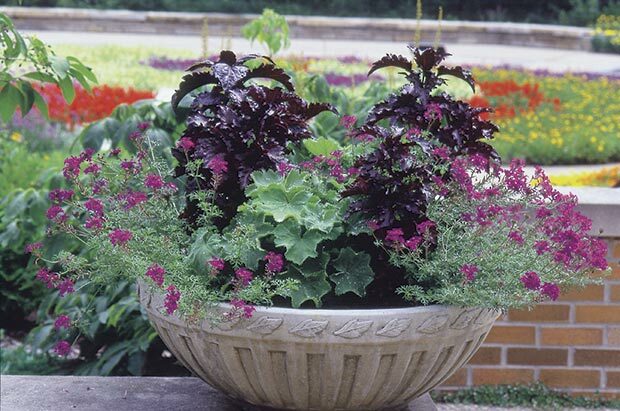 Annuals such as verbena (above), lobelia and pansy that thrive in cool weather but disappoint during the dog days can be clipped back, watered, and left to regroup for an encore in fall. Cut back your heat-stalled annuals now. They’ll grow back over the next month and resume blooming shortly after the heat breaks in August. The first aim of cutting back is to eliminate all the seed pods that are developing—as seed forms, it delays formation of new blooms. The shearing also stimulates new, bushier growth. You can clip so far as to leave only a few inches of stem. Keep the plants well-watered and apply a half strength, water-soluble fertilize after a couple of weeks. 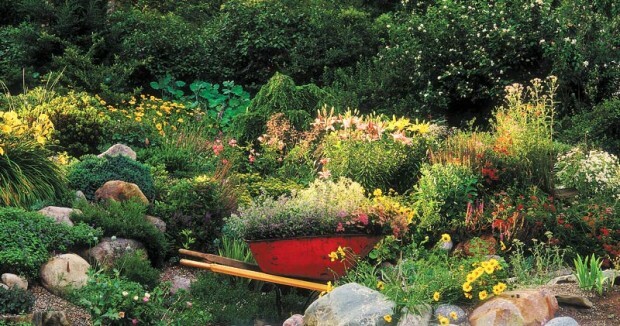 Be careful not to overdo the water or fertilizer for plants in a container. Once cut back they have less leaf surface to take up water. They may need less frequent watering than they did in spring since they’re taking longer to use what the pot can hold. Just close your eyes and smell. Tall phlox and bee balm may be gray with powdery mildew, but their scent is still wonderful. Just close your eyes and smell. Powdery mildew annoys people out of all proportion to the damage it does to plants. In spring, one kind of mildew fungus or another can and usually does infect the leaves of tall phlox, bee balm, aster, zinnia, perennial sunflower and some other garden plants. During the cool weather the fungi grow slowly within the leaves, which continue to function normally if less vigorously. Then when conditions are right, the fungus finishes its development and covers the leaf with gray spores. By the time we see gray, the damage is already done. You can try to arrest the mildew’s spread by plucking off all discolored leaves and spraying a fungicide on those that look healthy. Or you can sit back, close your eyes and smell—those sweet-smelling flowers still come, using energy captured by the leaves over more than three months. Spraying can add fuel to the July fires, though. 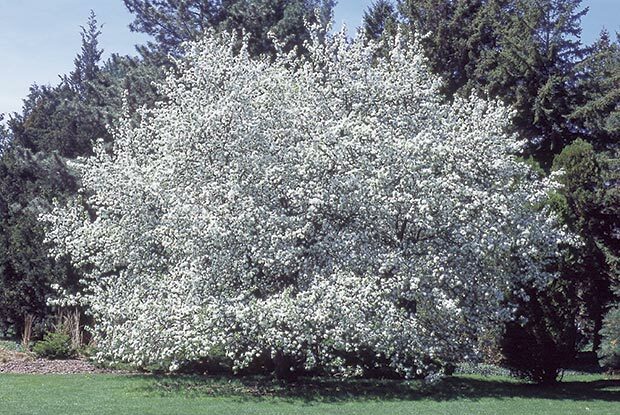 Whether it’s a purchased fungicide or one made with the baking soda on the kitchen shelf, applying it always carries some risk of burning the crabapple foliage or the leaves of sensitive plants nearby. The chances of causing a chemical burn are much higher when the air is hot and the plant is stressed by drought or heat—July conditions. Don’t run up a tab for a scabby crab. Crabapple scab is a fungus that acts much like powdery mildew, infecting early and showing itself late. It’s not unusual for a crabapple that’s susceptible to apple scab to defoliate by August. Its leaves yellow and drop off one by one as the fungus finishes its work. Once again, this is disfiguring but not a threat to the crabapple’s existence. Given an observant resident gardener as a guide, you can find at least one full-sized, regularly-blooming crabapple in every neighborhood that has dropped its leaves early every year for 30 years or more. Even if July’s pressure makes you feel you must do something for a scabby crabapple, all you should do at this point is rake up the diseased foliage and cart it away. Don’t run up a tab for a scabby crab. 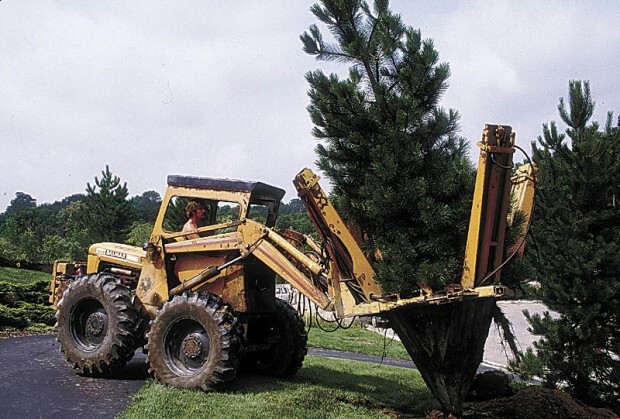 The tree won’t suffer any lasting damage if its leaves are destroyed by fungus and fall off in July. Rake up the mess, throw it away, and let the tree’s bare branches help you imagine yourself sitting in September’s cool breezes. Then, if you still feel anxious about your crabapple next March, you can call a tree care company and sign up to have the tree treated several times with a scab-preventive fungicide, beginning when the leaves first begin to grow. Don’t try it yourself—most home spray equipment is far too small and most crabapples are far too big to be an effective match. Janet Macunovich is a professional gardener and author of the books “Designing Your Gardens and Landscape” and “Caring for Perennials.” Read more from Janet on her website www.gardenatoz.com. Here’s an intelligence report on some of the most persistent and sneakiest garden weeds of Michigan gardens. To pack the most information into available space, we’ll let pictures and vital statistics do the talking. If you’ve battled these and been beaten, I don’t doubt you’ve tried, but I do doubt that you understood and matched the persistence of your foe. Cut off their heads—their green, leafy source of energy—and they sprout anew from deep, extensive root systems like the mythical beast which sprouted two heads each time one was cut. Each cutting, digging or herbicide application by the gardener puts a drain on the roots’ starch reserves, but each day a new shoot gathers sun, it replenishes those roots. If you attack just once, twice or three times a year and let the survivors surface and gather sun for weeks or months during the cease-fires, you insure a perpetual war. To best the beasts on this list, beat them at their own game. After you roust out every bit of green and as much root as you can reach, post a guard. Expect new shoots within a week. Find them and cut them before they can return to the root the starch they used in reaching the sun. Be vigilant in this follow up and you will gradually exhaust the weed’s reserves. Wild garlic (Allium vineale), which hides its narrow foliage among grass blades, can always be identified by its smell. Survives mowing as well as grass, escapes broadleaf weed killers, and stores enough energy in the bulb to return repeatedly if weeders leave the bulb behind. Infestations are usually best handled by killing or digging out all vegetation in the area and then maintaining a thick mulch and a weeding vigil for 18 months. Mexican bamboo, Japanese knotweed (Polygonum cuspidatum). 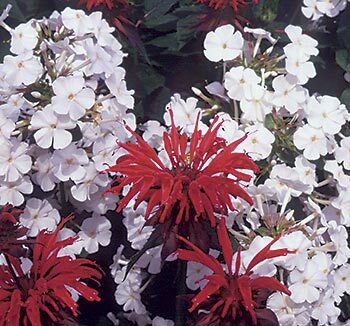 Perennial, up to 9 feet tall, spreading far and wide from established clumps by stout underground runners (left). Jointed, hollow stems explain the common name “bamboo.” The center section of stem has been eliminated in this photo for clarity’s sake. Grub out the roots or apply Roundup and be prepared to kill remnant sprouts for a season or two. Perennial, wickedly persistent Canada thistle—Cirsium arvense, which is not native, despite its common name. A stem and a basal clump are shown here, left of the glove. 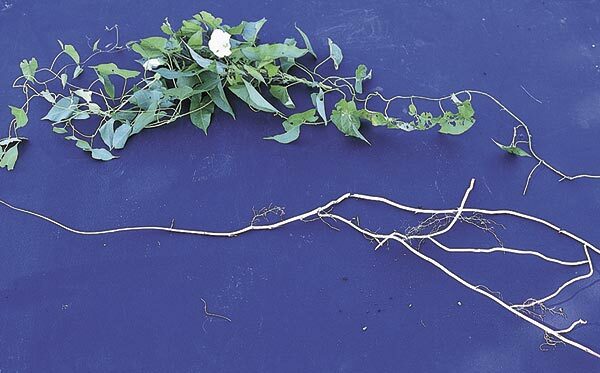 Note the running roots, which can persist and keep sprouting even through a year or two of frequent pulling or spraying with herbicide. The key to control is to be even more persistent than the plant and to adopt as a mantra what Edwin Spencer writes in All About Weeds, “…any plant can be killed—starved to death—if it is not permitted to spread its leaves for more than a few days at a time.” The annual prickly sow thistle (Sonchus aspera), immediately right of the glove, and biennial bull thistle (Cirsium vulgare), far right, are weedy but not nearly so much trouble to eliminate. Just keep pulling or cutting the annual and biennial thistles before they set seed, and keep the area well mulched to prevent existing seed in the soil from sprouting. Violet, common blue violet (Viola sororia). Perennial, often tolerated in gardens for its blue-violet flowers in spring, yet hated for colonizing nearby lawn. A typically schizophrenic approach by gardeners! Either accept it in both places or eliminate it from both. 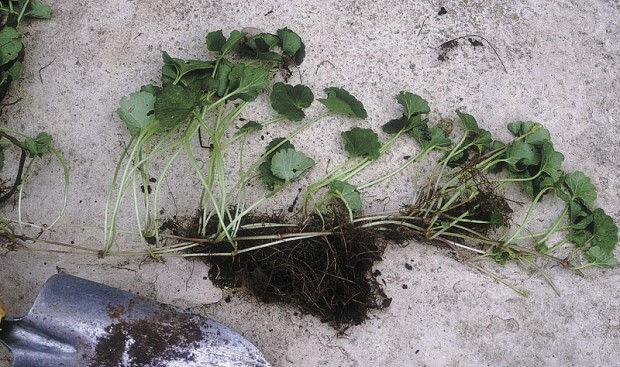 Like ground ivy, it can be killed in lawns with broadleaf weed killer—may take repeated applications—but will then return from seed if the grass is not pampered until thick enough to shade out the seedlings. Perennial nut sedge or yellow nutgrass (Cyperus esculentus) infuriates gardeners by returning even if pulled and pulled again. But of course it returns if the soil is not loosened deep and well so that the brown nut-like tubers come out, too. 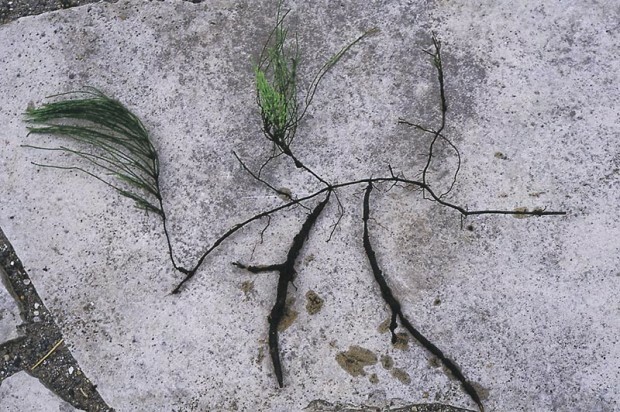 In the inset photo, note the horizontally-running root, which turns up to produce a second clump of “grass” and the new crop of nuts developing as white bulbs at root tips. Nuts can rest dormant for many years in the soil and be revived by deep excavations. Frightening to think nut sedge tubers are edible and somewhere a large-tuber form may be in development as a food crop! Ground ivy, also called gill-over-the-ground, is Glechoma hederacea, a perennial. It snakes through lawn, rooting where its stems make contact with bare soil. In gardens, freed from a mower’s restraint, it explodes to become a dense mat and can weave its way 18 inches up into stems of other plants. Shallow-rooted, it’s easily pried loose from beds and mulch will prevent it from reestablishing by seed. However, it must also be banned from adjacent lawns. 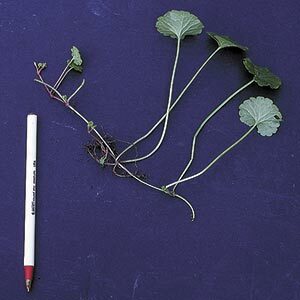 The broadleaf weed killer Trimec will kill it, but the lawn must then be overseeded and thickened by better care lest ground ivy seed simply sprout and re-take the bare soil between grass plants. Sometimes confused with henbit, an annual. Field horsetail, or scouring rush (Equisetum arvense), is a native perennial often brought into gardens in tree and shrub root balls. Easiest to eradicate if caught early in its tenure on a property, otherwise it must be dug and surviving pieces starved by repeated pulling. 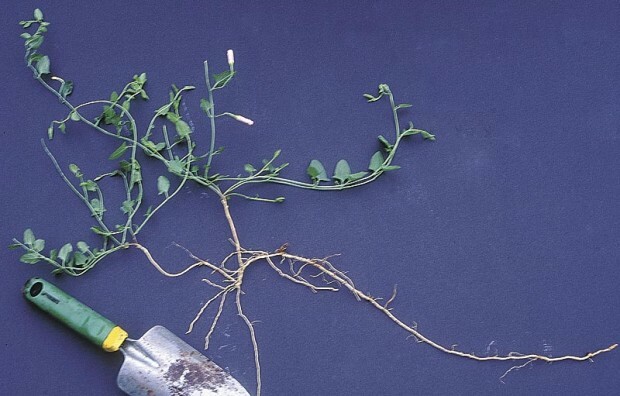 Convolvulus sepium, the great bindweed (pictured) and its smaller-flowered, smaller-leaved, lower reaching cousin C. arvensis, small-flowered bindweed. Perennial. Extensive, deep, easily broken root systems. My own experience mirrors that of W. C. Muenscher who writes in the textbook Weeds, “Clean cultivation…if performed thoroughly, will control bindweed in two years. The land must be kept black, that is no green shoots should be allowed to appear above ground. Cultivation should be at frequent intervals of about six days. Under certain conditions this time may be extended a few days and under other conditions it may have to be shortened to three- or four-day intervals. These weeds earned places on this list by their tendency to present a false face or ride in on invited guests. 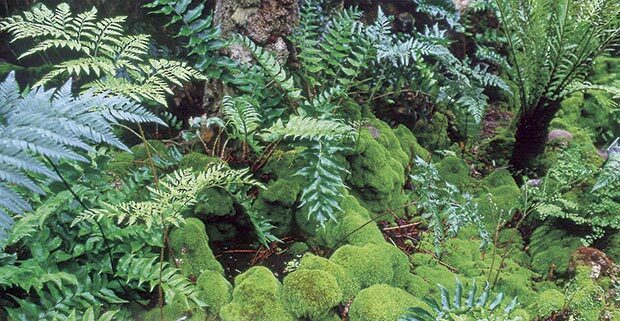 Once their true natures and their avenues of entry into a garden are known, they are relatively easy to eradicate with informed pulling and thorough mulching. 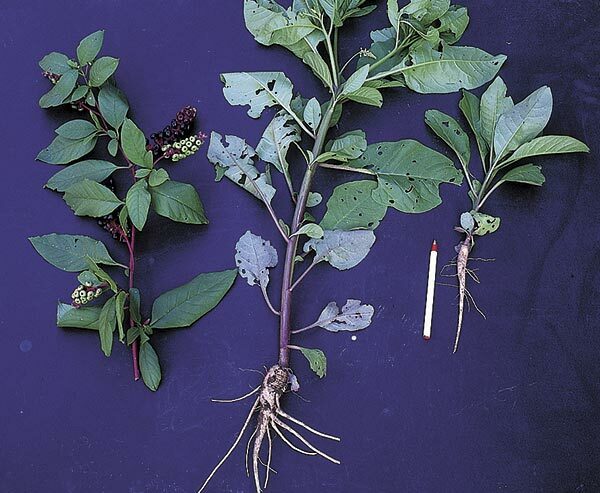 Pokeweed (Phytolacca americana) is an impressive, statuesque plant draped in purple-black berries in fall. Birds love this native fruit – although it is quite toxic to humans – but gardeners wish their feathered friends would eat all of the berries before they fall and then not excrete any! 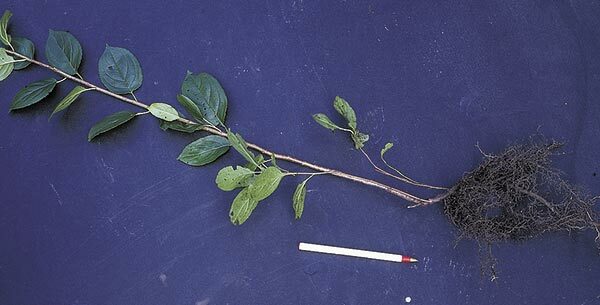 This photo shows the berries of an established plant – up to 9 feet tall and wide – and the roots of seedlings just 4 months old (center) and one month old (right). The roots don’t run but they do delve deep, so pull them early or be prepared to dig deep. The native perennial, enchanter’s nightshade (Circaea canadensis) is rarely seen in sunny gardens but can drive a shady gardener wild, especially when the buried seeds ripen (right photo). In seed, it seems to pull out easily and completely, but careful loosening of the soil before pulling will reveal the new, white, nearly-detached perennial roots (left photo) which can lie quietly until the next spring. Glossy buckthorn (Rhamnus cathartica) is a small tree with very bad habits. It leafs out early in spring and keeps its leaves far into fall, effectively shading out native plants wherever it sprouts. Since it can thrive in woods, sun, wet areas and dry, it’s a serious threat to native ecosystems of all kinds, as well as gardens. The seeds don’t travel far on their own. Birds eat and then drop them where they roost so the trees are common along fence lines. Fast growing, the gardener must patrol for and pull them at least once a year, and try to locate and remove the mature plants which are providing the shiny black berries. One thing gardeners can be thankful for is the plant’s shallow, fibrous root system – far easier to pull than other woody weeds such as mulberry and tree of heaven. Yellow wood sorrel, right, (Oxalis europaea) seems frail and easy to pull, compared to its ground-hugging cousin, common wood sorrel, below, (Oxalis stricta). But like enchanter’s nightshade, the yellow wood sorrel has a deceptive root system. Pull it and it seems to come up easily, roots and all. Yet if one loosens the soil well before pulling and uses a light touch, it becomes clear how many fragile, white, running perennial roots can be left behind by the uninformed gardener. 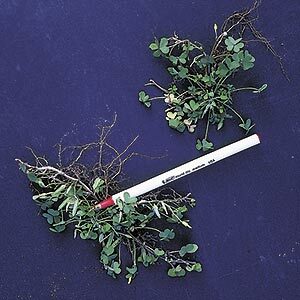 Far easier to deal with is the common wood sorrel, which does not spread below ground but only above where stems sit on moist soil and root (the pen points to such a stem). If you crush the stems or foliage of Virginia creeper, do not allow the juices to get on your skin. My hobby-turned-profession has brought me up close and too personal with so many surprisingly dangerous plants that I’ve cultivated a downright awe of plant defenses. Each time I encounter another plant-based allergic reaction, skin irritation or chemical burn, my library and files swell with more books and articles. In pursuing one or another plant, I’ve come across cautions on so many other, common garden plants and said “Ah ha, so that’s what that other thing might have been!” so many times that I thought you would be interested in some of the discoveries too. In listing these plants I do not intend to put an end to your enjoyment of any plant, but to point out where precautions might be in order. You’ll probably even find that to eliminate all potentially harmful plants from your garden or landscape would be very difficult, simply because so many plants have potential to cause harm. Better to learn safe ways to interact with plants—wear gloves, cover your arms and legs while pruning and gardening, wash well after being in the garden, and eat only known edible plants. So knowledge is your best defense against plant defenses, and you should be prepared to learn more every time you add another plant to your garden or yard. Start by learning the several categories of dangerous plants: 1) those we shouldn’t allow to contact our bare skin, 2) those with pollen or other airborne elements that can cause distress if inhaled, and 3) plants we shouldn’t eat. When you rub fennel (top), Queen Anne’s lace (above left), or rue (above right), on your skin, then stay out in the sun, a burn-like rash will appear. Growing any of these plants is good reason to cover your arms and legs when working in the garden. Of these three groups, we are most likely to come across those that irritate or inflame the skin on contact. That’s because we often expose bare skin when we garden and it’s not necessary to be allergic to react to many of them. The trouble with these plants are chemicals in their saps, thorns or prickles, or needle-like crystals contained in the cells which can seep out when the plant is bruised or cut. If you think you may have contacted the sap, flush affected skin with water and wash it with a mild soap. Hydrocortisone cream may help relieve the irritation if it develops. Seek medical attention if the reaction is severe. Keep your arms covered and face averted when you cut down that ravenna grass each spring, since the edges of the blades are sharp enough to inflict serious damage. Other plants that cause contact dermatitis in some people may do so because of the bristly nature of their leaves (see list below). Tiny spines, as from cactus, can be removed by applying and removing adhesive tape or spreading and allowing white glue to dry on the skin, then peeling it off. 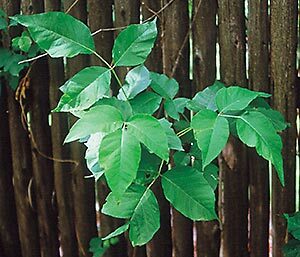 Perhaps our best defense against dangerous plants such as poison ivy is to learn to identify them and steer clear of them! Plants that cause allergic dermatitis. Some plants contain chemicals or have surface irritants which trigger allergic rashes in some, but not all people. Generally, reactions occur after the person becomes sensitized to the plant—it may take one or many contacts with a plant over many years to develop the sensitivity. The skin reacts most severely and most quickly where the most contact occurred, so that some parts of the body may “erupt” in a rash or blisters hours or days before another. 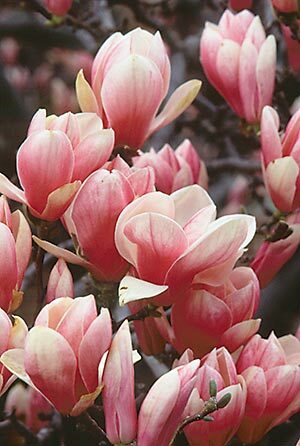 It’s hard to believe that something so universally loved as a magnolia can also be a dangerous plant. Yet some people are allergic to it, and develop a rash on contact with it. Plants with airborne pollen, such as ragweed, grasses and many conifers, can cause allergic respiratory distress. Those who suffer from pollen allergies should garden and landscape with plants visited by bees, moths, butterflies and hummingbirds, because such plants have heavy pollen which does not float but needs a lift to the next plant. Hosing down areas before working or playing outdoors can also be helpful, as wet pollen is less likely to waft into the air. Although garden plants that, if eaten, can cause severe intestinal distress, nervous disorders and even death may get the most publicity of all dangerous plants, they are the most easy to live with—just don’t eat them! Never taste or eat any plant unless you are certain of its identity and safety. Some plants are more dangerous than others, for various reasons. Tiny quantities of one species such as monkshood can cause great harm, while large quantities of another such as apple seeds or privet berries must be eaten to produce even mild side effects. In a few poisonous species such as anemone, calla, caladium, and Jack-in-the-pulpit, the symptoms are called “self-limiting,” meaning that it’s very tough to eat enough of the plant to cause life-threatening trouble since the plant is extremely distasteful or causes immediate burning and blistering on the tongue and lips. The result of eating some toxic species may be gastrointestinal distress, which may be serious in young children and weakened adults, but may amount only to a tough lesson learned to other people. Some plant-produced toxins can cause circulatory or nervous system disorders as well and so are more serious. Some plants are toxic from top to roots, such as water hemlock. In others, poisons are concentrated enough to cause serious harm only in certain parts of the plant, even unlikely parts to eat, such as cherry and peach pits which contain cyanide. Lunacy: Does it hold sway in your garden? Left: The moon rules the tides. Right: Does it also rule the growth of these plants? Lunacy. Spoken of a person, it means mental derangement and irrational actions. Use it in relation to plants and it means scheduling farm or garden chores according to an orderly celestial pattern. Two very different definitions. Or are they? Lunacy is a traditional method of synchronizing one’s sowing, tending and reaping with the predictable phases of the moon and luna’s position relative to the constellations of the zodiac. A lunatic will plant perennials in the week following a full moon because he or she is assured by lunatic tradition that those plants will prosper better than perennials planted during the second week after a full moon. If that follower of the moon has either a thoroughly practical background in sky-watching or an almanac which lists the moon’s phase and position in the zodiac for each day of the year, he or she may also decide to plant only on the third and fourth days of that week. That would happen because the moon was “in” the constellation Scorpio during those dates. 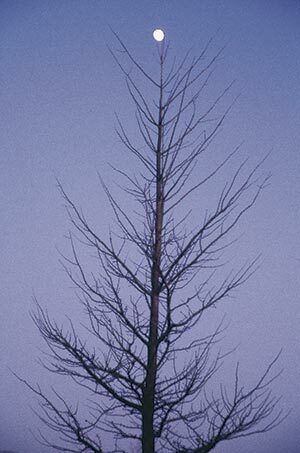 Lunatics maintain that the moon in such a position exerts a prime and positive influence on plants. Sound confusing? I looked deep into lunacy this winter. I came away skeptical but still interested, enough so to offer my findings to you. I outline the basic principles of lunacy and specifics for this spring’s garden chores in the chart on page 34. Above and below: Lunar gardening stipulates that perennials will grow best long term if planted in the week following the new moon. I have viewed lunacy as I do the predicting of ocean tides for 3 reasons. First, tidal predictions and planting calendars were both so important to early man that natural events were scrutinized and religiously recorded for countless generations to improve the accuracy of those forecasts. Finally, and probably most importantly, the moon figures prominently in each of these disciplines yet in neither case can I describe the connection without making it sound like magic is involved. I first have to ask that the reader accept gravitational theory, that the moon is responsible for the sloshing of water back and forth across Earth’s ocean basins. I would present this as a scientific fact even though I can offer no simple proofs and so it may feel to you as it does to me—like an item of faith. Having done that, how can I fail to be equally serious about lunar influence on herbaceous plant cells? After all, they’re 95 percent water and quite pliable. The moon’s effect on these tiny watery bodies may lack the scientific proofs of tidal study, but it seems equally plausible to me. 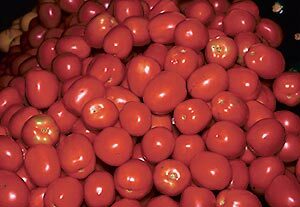 Since the tomato is an annual that bears fruit above ground, the moon’s influence will be most positive on it if it’s planted between the time of the new moon and the full moon. I’ve found the two to be drastically different in practical application, however. I have recalled and used my “Tides and Lunacy” notes now and then, about as many times regarding tides as lunacy. Yet where checking on tides yielded a clear result, my attempts to employ the moon to better my garden were not so conclusive. For instance, I checked an almanac when we planned to visit an Atlantic beach with water-loving, but wave-shy toddlers. Without question and just as foretold in the chart, it was low tide when we arrived. Yet I was unsure of the result when I planted according to lunar lore for a faster, better yield from peas. The seedlings seemed to appear quickly and the plants to be very productive, but I couldn’t be sure of either, lacking differently-timed peas as a comparison. I keep looking for science in lunacy, though. First I read a no-till farming association’s report that fewer weeds sprouted in test fields cultivated at night than fields tilled by day. Then I wonder if this might be once-removed proof of the lunatic prediction that a bed weeded in the week before new moon (the dark of the moon) would stay weed-free longer than if weeded at another time. In night tilling, seeds receive dim moonlight rather than bright sunshine. Weeding on a date when there will be no moon means less total light reaches the seeds during their first 24 hours than if the moon did shine. So, both the no-till tests and the lunatic procedure involve less total light reaching weed seeds early on. If that first 12 or 24 hours is critical to weed development and if seeds can be shown to accumulate light-hours in the same way growing plants do, there might be something here. Despite the nebulous connection between lunatic lore and results, serious lunatics have failed to conduct credible scientific studies that might cement the two. Believers seem to prefer to keep building upon that base as if it was rock steady. The moon may be a bigger part of your garden than you imagine. This second situation could explain some of the discrepancies of modern lunacy, such as “plant all perennial crops in the 3rd quarter” and “plant annual crops with seed outside the fruit such as asparagus in the first quarter.” Asparagus is a perennial. That’s undeniable. That it was assigned to a group of plants with “seed outside the fruit”—a vague concept never fully explained in lunatic tomes—may have been the work of a clergyperson desperate to be kept on! So here I remain, on the fence but still leaning toward the moon. I want to believe that those seeds which popped up in half the predicted time were pulled by the waxing moon and that I will see the same result again if my garden ever depends on it. Yet I don’t have enough need for quicker, better crops to justify spending the time combing the almanacs, determining the best dates for this or that, and making tests. I hope you have fun this year in your new view of the moon. And who knows? 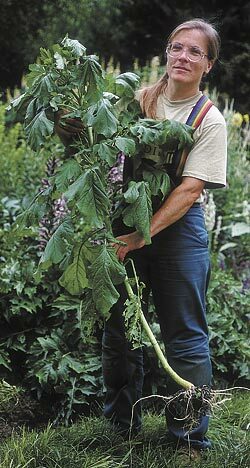 Maybe some loony thing you do will net you the tastiest tomato or huskiest hollyhock ever! It’s tough to bring our green, growing stuff to a graceful end at the edges of our property. Here what could be an abrupt finish is softened by a seed-laden shawl of Clematis recta wisely grown to cover only a portion of the picket fence. Full coverage would simply replace one vertical wall with another. Sometimes while gardening, sinking my fingers and soul into the earth, I forget where I am. Entranced by a boundless web of life anchored to the plants in my hands, my own boundaries move outward and I float free in the universe. Until my work takes me up to the edge, that frustrating place where my property butts up to a neighbor’s. How stifling to the artistic gardener, to be hemmed in with such unequivocal straight lines. So tough to bring our green, growing stuff to a graceful end at that all too rigid but oh-so-necessary political boundary. Perhaps the toughest kind of line is the edge of a small property, a city lot. Already too confining for some gardeners, that space seems to shrink further when filled with people and pets, outlined with fences and weighted with public sidewalks. In front, the property line slices through and lays claim to what appears to be a sliver of the neighbor’s lawn. A non-gardener may cede that land to the lawn-owner, but the green thumb, already chafing about lost ground in other areas, sees it as a strip garden marooned on the far side of the driveway. Adversity being the mother of invention, the garden grows from there. Maintaining dominion over that strip is simplicity itself—draw a straight line and plant. Hedges are conventional, safe plantings for such a spot. Or are they? 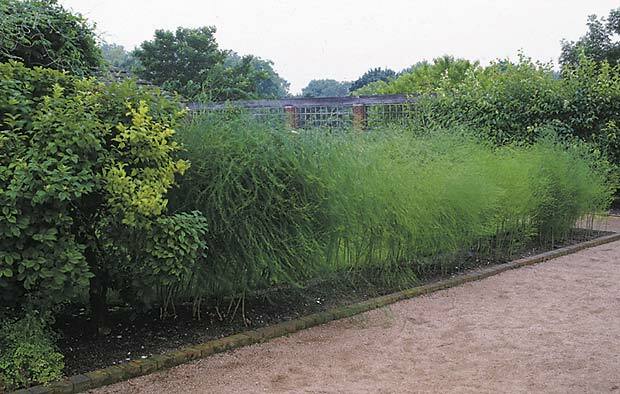 For more height in a herbaceous hedge, consider using ornamental grasses, vines on a trellis, even asparagus (pictured here). A straight line of plants need not have straight sides or tops. It can be tall at one end, short in the middle, medium height at the far end, as in this edge garden of black-eyed Susans (Rudbeckia ‘Goldsturm’), ravenna grass (Erianthus or Saccharum ravennae), pearly everlasting (Anaphalis margaritacea), rose of Sharon (Hibiscus syriacus), perennial sunflower (Helianthus x multiflorus) and European cranberrybush (Viburnum opulus). We ought to plant narrow strip edges with a shorter turnover in mind. Daylilies, peonies, black-eyed Susans, and Sedum ‘Autumn Joy’ make excellent short hedges that can be cut to the ground without harm when needed. Sometimes neighbors agree in advance to plant or replace a hedge, decide together on the species of shrub to be used, even splitting the cost. Such jointly-owned hedges often straddle the lot line. “True enlightenment,” one might think. Only if people stayed planted as long as shrubs do. Our roots have atrophied, though. Homes change hands far more frequently than they did when hedges were king. Hedge care falters in the transition. Ownership of boundary plants becomes fuzzier with each new tenant. Hedge co-owners sometimes find themselves suddenly hedgeless, victims of the neighbor’s landscape renovation scheme—a neighbor who did not know he or she was only part owner of the plants. In recognition of all that can go wrong, we ought to plant narrow strip edges with a shorter turnover in mind. 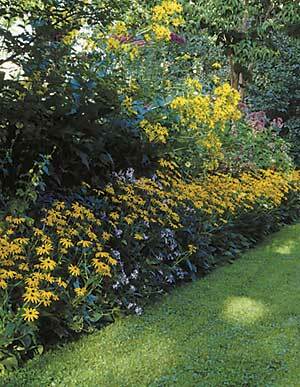 Daylilies, peonies, black-eyed Susans, and sedum ‘Autumn Joy’ make excellent short hedges. Individual plants in the hedge are much more portable than shrubs, can be cut to the ground without harm when home maintenance work demands a clear path, can recover in a year if damaged by a new driver’s wayward steering, and can provide far more color than shrubs which lose some flowering wood at each trimming. 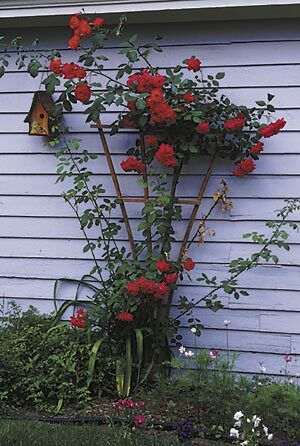 For more height in a herbaceous hedge, consider using ornamental grasses, vines on a trellis, even asparagus. Although these selections may fall a few months short of a full year presence, they make up for that failing in speed of establishment. In just two years, a row of zebra grass (Miscanthus sinensis ‘Zebrinus’) can make a solid six-foot wall. The wall disappears from April 1 until June 1 as the plants are cut to the ground and bounce back, but it’s there in full density during the height of the summer barbecue season and the windiest winter storm. 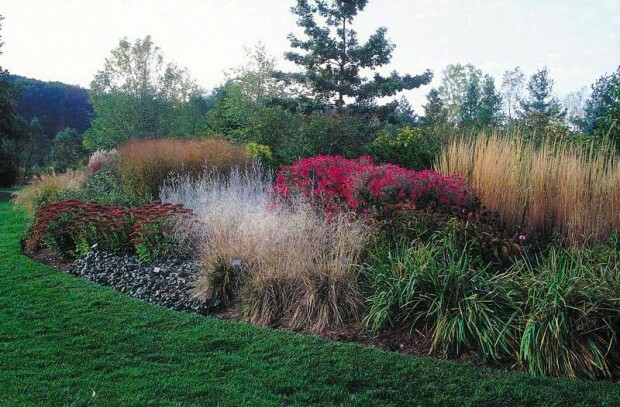 Even within a narrow rectangle, an edge planting can have a curvaceous top or side. 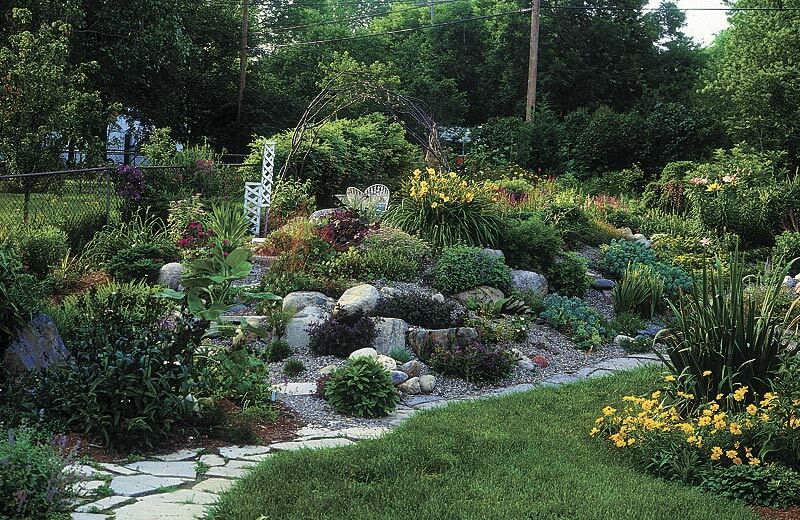 These beds of peonies, veronica and sedum form a wavy line along an edge that could have been a boring rectangle. What about the gardener’s need for artistic expression? He who loves curves can become frustrated with long, narrow spaces that seem to demand long, straight lines of plants. However, a straight line of plants need not have straight sides or tops. It can be tall at one end, short in the middle, medium height at the far end. It can consist of several types of plants of naturally varying widths and heights or a single type pruned to create a curvaceous top or side. Try it—draw a narrow rectangle. Now draw a wavy line within the rectangle, along its long axis. To plant the line, stagger plants to trace the crests and troughs of those waves. As you maintain the bed, remember to preserve open space between the straight edge of the bed and the plants. This may mean strict use of pruning shears or careful selection and thinning of plants. Deviating from a straight line can have advantages in neighborliness. No one likes to feel that he or she has been walled out of an area. One way to break up a forbidding wall is to interrupt it with an inviting window or door. Think it through before making the breach and it will be inviting without being a blanket invitation to peep or enter without knocking. Place the opening carefully and you can offer a pretty vignette yet preserve privacy. Set the door in a logical place and neighbors—even children—will use it. If you don’t want it used too freely, sink a pair of posts and hang a gate. Think ‘outside the box.’ A neighbor’s garage can be a good background for a climbing rose, even if the neighbor won’t let it be planted flush against the garage or attached to the wall, as was the case with the unattached rose in this photo. So long as the rose is in front and the wall behind, the combination works as if the wall is yours. Sometimes although we want to garden along the edge we don’t want a line at all but some less divisive visual flow from one property to the next. That’s the place to step back and take a wider view. 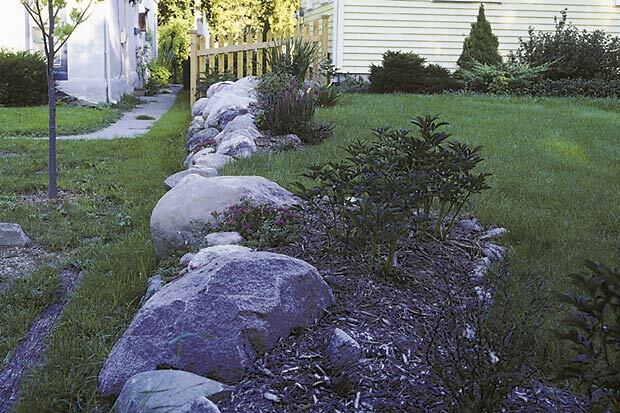 Design the edge to continue an existing bed on the neighbor’s lot, or one on your lawn across the driveway. Even if the outlines of your edge bed and the other don’t join directly, you’ll achieve a unified effect if it appears the two beds’ edges would flow into one other if extended. 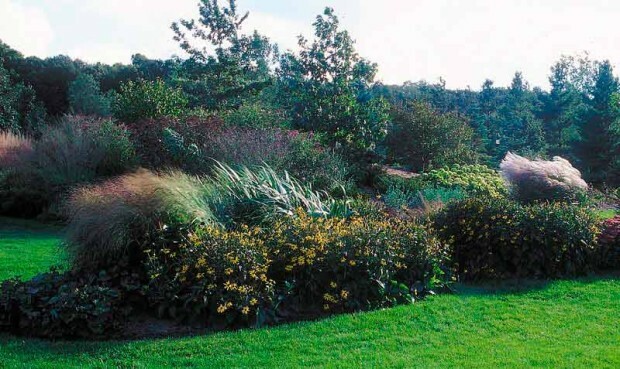 Another way of connecting isolated beds is by planting them to repeat species, color, texture, shape or alignment of plants in other areas. The link can be strengthened if the same or related non-plant items appear prominently in the beds. If an abstract rusted metal sculpture with a southwestern desert feel anchors one bed, repeat that theme in the next. Sometimes house placement and fencing isolate an area from foundation to lot line along one side of the house. The area may be accessible to its owner only by a long walk around and across the front yard, and then can be viewed straight on only from the neighbor’s driveway or patio. Some people leave such an area in lawn for ease in care and neatness of appearance. Some garden the space for the fun of gardening and the pleasure it gives the neighbor. Others cede care of the area to the neighbor if that person has both the best view of the bed and a desire for more gardening space. If you’ve granted gardening rights to the neighbor on such a space, ask for compensating land elsewhere along your shared line. Who knows, maybe that neighbor is fed up with gardening the strip along the driveway and will let you take it over to expand your lawn! One couple, unable to compromise their divergent tastes, drew a line down the middle of their yard. On one side, she gardens with wild abandon. It’s quite the contrast to his beds, which are a study in formality. Some people wear all hats in a garden: designer, supreme commander, sole worker, and undisputed owner of all praise of their property. It’s an exhilarating kind of gardening, if a bit lonely. It may also be the exception. More people are gardening than ever before and households consist of ever more diverse collections of people, so gardens are now being shared by partners, teams and even opposing camps. Today, horticultural skill no longer guarantees gardening success. 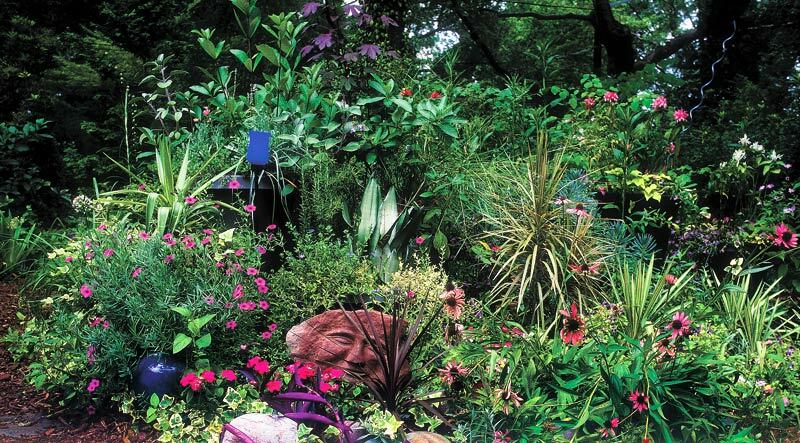 A gardener needs a green thumb plus diplomacy, humor and the art of negotiation. Looking at relationships that grow within shared gardens and examining your own sharehold is a way to improve your own non-horticultural gardening skills. 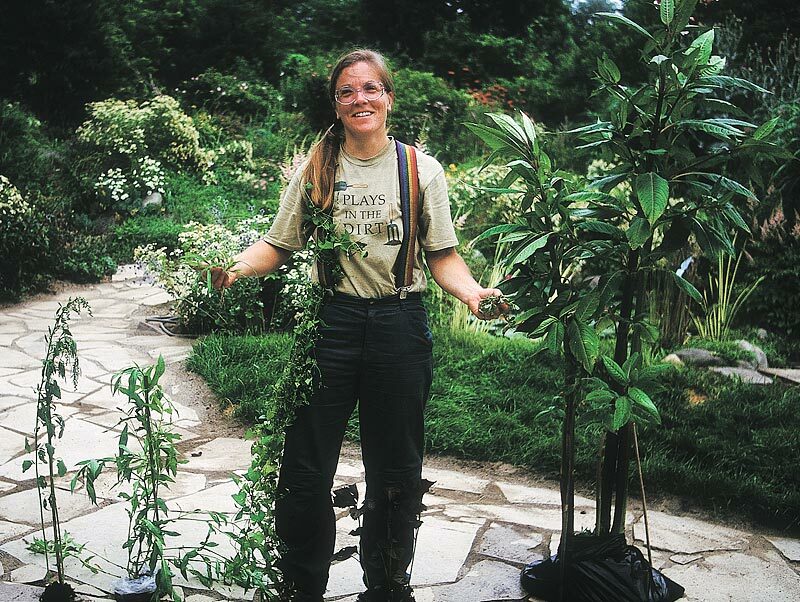 Gardeners’ interests change, and their garden sharing agreements should, too. Young children may like open areas, older children may want seclusion. All of them like water. There are traditional ways to share a garden. One gardener designs, while planting goes to the other(s). One grows ornamental plants, leaving vegetables to the other(s). One mows, the beds belong to the other(s). One is master of everything woody in a yard while dominion over “soft” plants—flowers and vegetables—goes to the other(s). Each gardener may have a distinct area, as when two gardeners agree that one gardens in front, the other in back. Or distinctions may be by pecking order as when one directs while the other does as told. Division of duties might be mercurial—some gardeners modify their agreement for each plant and project. It can also be adversarial – I’ve seen gardeners make controversial changes while a partner is out of town, hide expensive purchases, even call in referees. The resulting garden might be uncomfortable for some, but not for those who like some spice, have a keen sense of humor or revel in a challenge. There are also unique approaches to sharing. 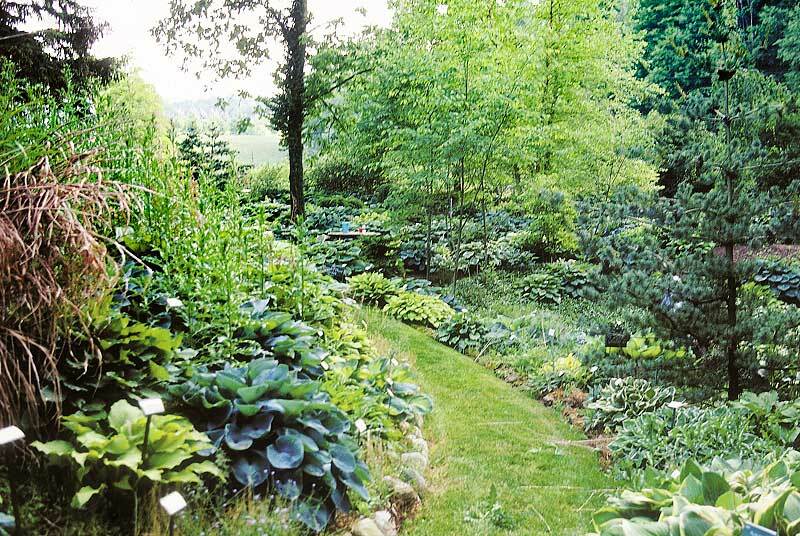 One couple employed the “distinct area” approach—he gardened in front, she in back—until he became bored with the front. Its public aspect was restrictive of personal expression. They began gardening the front as a team but in back, unable to compromise their divergent tastes, they drew a line down the middle of the yard. On one side, she gardens with wild abandon. Across the way, his beds are a study in formality. The view from the back door can be bizarre, until one learns to focus not in the middle but to left or right. 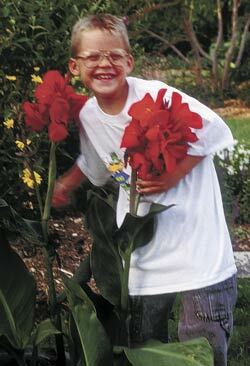 But Cory shunned it for bigger, bolder canna. Another unusual sharing is “my year, your year.” The people I saw employing it were partners who had done standard sharing for many years and had reached a base agreement as to overall layout and annual budget. In odd-numbered years now she is head gardener, with sole authority to redesign, while he is “under gardener.” In even years, the roles reverse. These people are not overly competitive and secure in other aspects of their relationship, so the results are fun to see. 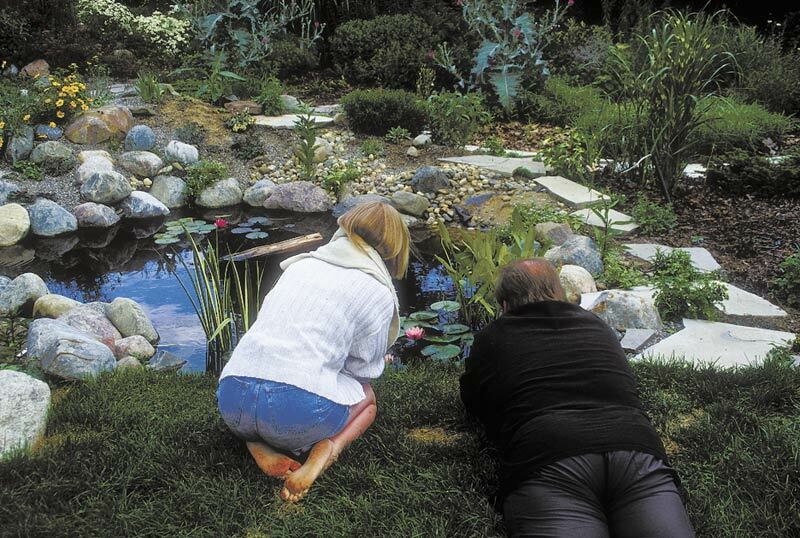 In gardens shared by children and adults, a common approach is “I made this for you,” in which the adult designs and plants a play area within the garden. Another standard is to give children distinct areas: “these two rows in the vegetable garden,” and authority with some strings attached: “you can plant anything you want so long as…” Less often, kids are encouraged but not required to garden and carve out places of their own over time. What is your garden sharing arrangement? How do you and others involved feel about your roles? Is change or clarification needed? One man redrew his sharing arrangement when his daughter bought a home and needed landscaping help. His wife—always the planner and director in their shared garden—was out of town so he tackled the landscape renovation on his own. He was surprised at how much fun it was. He and his wife now deal as equals in their garden – the wheels of that change having been well greased by the fine landscape he designed and executed at their child’s home. Children grow quickly. Their interest in a garden sharehold can change as often as their shoe size. When my children were very young, they shared as spectators in the garden. From backpacks on our backs, they saw what we saw and heard what we said but were not at first allowed to touch. Later they were assigned to certain areas and allowed to do as they pleased. 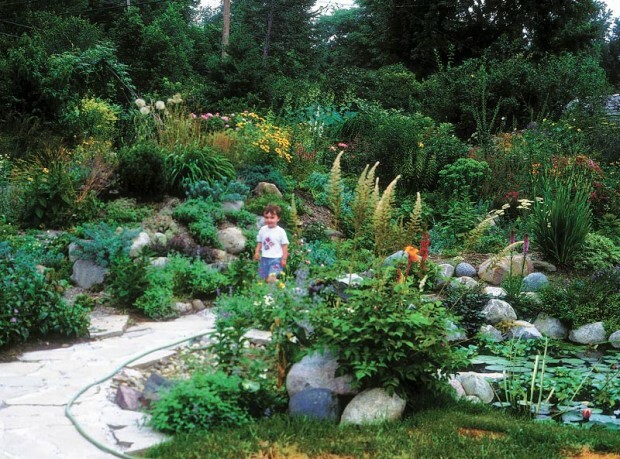 Sometimes the best way to share a garden is to give each gardener a distinct area and complete dominion. As they grew and their interests changed, we tried to change their shareholds to match. For a time, when our son found destruction to be a fascinating pursuit, we included him in anything that required the use of an ax or hammer. When both children developed a yen for privacy, their garden area moved from a central, open spot to a secluded corner. We didn’t make or assign that move but came home to a fait accompli, a corner having been usurped and redesigned, complete with water garden. We might have been angry except that we accepted the mercurial nature of our shared garden contract. Now that our children are grown, their corner is one of our favorite places. It may represent the first time we realized that our gardening relationships are worth far more than our gardens, but it won’t be the last. My husband, Steven, and I started out sharing our yard by plant category—lawn was his, everything else was mine. His share of the bargain decreased as my beds encroached on the lawn. With less mowing to do he paid more attention to what I was doing and developed so much interest that he went back to school and completed a degree in horticulture. This called for a new garden sharing arrangement! Enjoy your garden. But treasure and protect your garden sharing relationships. By gradual degrees and mutual consent, I retained responsibility and authority in the beds while he increased his participation in a way that pleased me and satisfied his intellectual and proprietary interests. His role is now that of occasional helpmate, full-time sounding board for ideas, sympathetic shoulder for tearful disasters, and proud partner in celebrating successes. Steven was not looking at me when I whirled around, but was already sifting through the pile of weeds he’d pulled. Water is the crux of gardening. For a beautiful garden, spend some time sorting out your plants’ individual water needs and how water flows in your soil. The hazy, hot eye of summer is upon the garden. Reach for the hose, but use your head for proper watering. Herbaceous plants—annuals, perennials, vegetables, etc., that have no wood to hold them up—are simply columns of fluids. Roughly 95 percent water, they stand because liquid pressure holds their cell walls taught. Remove much and they fold. Wilted plants might recover with watering, but damage is done during the wilt: from localized scarring of tissues and greater susceptibility to diseases that can enter through weakened tissue to the more general stunting that occurs because the plant was not able to photosynthesize while dehydrated. Photosynthesizing is the harnessing of solar energy to make food. Plants use sunlight to split water and carbon dioxide molecules in their leaf cells, then recombine those ions with pinches of mineral matter to make sugars, starches, cell thickeners, new cells and everything else they need. Sunlight is the fuel, but water is the main ingredient, lubricant, coolant and transportation device in these leafy factories. Water’s atoms become part of the product, but water also keeps all parts supple and cool enough to work and is the conveyer belt which brings ingredients together and moves finished products from leaf to stem and root. In brighter light and warmer air, the plant factory works faster and more water is needed to keep it running. No wonder plants ask for water every time we turn around in summer. The best thing we can do in July is to water wisely, not by rote but using a variety of methods geared to specific plants, soil and weather. Take the standard rule, to give plants one inch of water per week. Some of us set out rain gauges to measure rainfall, then turn on sprinklers as needed to top up to that one inch mark. Others read cumulative precipitation in newspaper weather charts and drag out hoses when rain doesn’t add up. Both are smart practices, better than setting an automatic system to run every day or two, rain or shine. Yet you can water even smarter. One inch per week is an average, but all plants aren’t average. Some need more because their leaves lose more water to evaporation, or when they’re ripening fruits, or if they were cut back and must fluff out all new foliage. Big, thin leaves may lose so much water through evaporation on a hot, sunny day that the roots can’t keep up even if a hose drips there constantly. As an example, look at a ligularia wilted into a green puddle. Many ligularia plants suffer from root rot in summer too, overwatered by a gardener who reaches for the hose every time the plant wilts. The soil becomes super saturated and airless, so they die of starvation and rot. Big, thin leaves in the wind and sun may lose so much water so quickly that the roots can’t keep up. Just look at a ligularia spread out on the ground like a green puddle. Some plants need less water than others on a hot or blustery day. Gray, furry or needle-like leaves are designed for minimal water loss. Hairs that make a leaf gray or furry form a layer around the leaf that prevents immediate evaporation or blow-drying of water vapor emerging from pores. The vapor is trapped and sheltered inside the fuzz where it can linger and do its job as a coolant. To grow a gray leaf plant like lamb’s ear (Stachys lanata) next to a wilter like ligularia, water very carefully, feeling for moisture in the soil at the base of each plant before turning the hose on just one plant or the other. 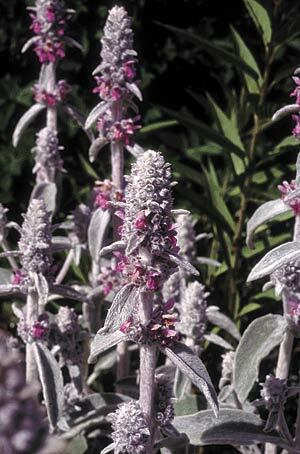 A gray leaf plant such as lamb’s ear (Stachys lanata) does well where it’s hotter and drier. It has a layer of hair on each leaf where water vapor coming out through the pores is trapped and protected. The amount of water available to roots isn’t based solely on amount of water poured onto the soil—that inch we measure in a rain gauge or in a wide-mouth container set on the ground under a sprinkler. Whether an inch will mean there’s enough, too little or too much water for the roots varies with type of soil, drainage, air temperature and wind. Sandy soil has large pores—spaces too big to hold water up against the pull of gravity. Water runs through sand more quickly than through the tiny pores in clay or loam. An inch of water applied all at once to sand may be gone in a day, though in clay it would have lingered at root tips for a week or more. So sand often needs more than an inch of water per week, meted out by the quarter- or half-inch every few days. Sand’s ability to hold water can be improved by topping it with evaporation-suppressing mulch and mixing into it a generous layer of organic matter or pre-moistened water-absorbent polymers (sold as “Water Sorb,” “Soil Moist,” etc.). These materials can absorb and only gradually lose up to 100 times their own weight in water. Yet even fortified this way, a sandy soil will dry more quickly than clay. Drainage is the movement of water and air through soil pores. Some soils drain quickly, others slowly. Often the drainage depends on the type of soil well below the surface, so even a sand may drain slowly enough that moss grows on its surface. The only sure way to know how long water lingers in a soil, and how soon life-giving air is also back in the soil after a drenching rain, is to dig a hole 3 to 4 inches deep and touch the soil. What feels cool is damp, but aerated. What feels warm or hot is dry. Soil that actually wets the fingertip is still draining. Doing touch tests can be revelatory. Even within a city lot with homogenous soil, some spots will dry more quickly than others. South-facing slopes and elevated areas may be dry while soil a few feet away is still moist, since ground tipped to the sun is often warmer and elevated sites catch more breeze and lose more water to evaporation. Dry spots in lawn or garden often show in early spring as dead patches or where one group of plants is slow to emerge. 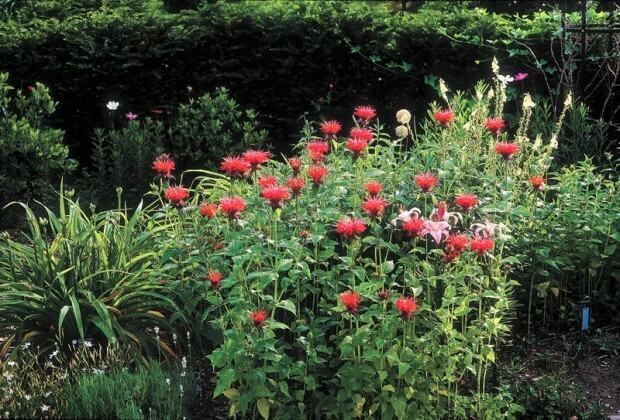 Bee balm (Monarda didyma) likes a constantly moist soil. If grown on the dry side or where it is very wet and very dry, its chances of developing powdery mildew are greater. Lungwort (Pulmonaria species) grown with drought-tolerant bigleaf forget-me-not (Brunnera macrophylla) in the dry shade is more likely to develop mildew than if grown and watered equally with hostas that thrive in constantly moist, well-drained soil. Roots grow if the soil around them is moist enough to supply water and nutrients needed to fuel cell division. They don’t grow if soil around them is too dry. 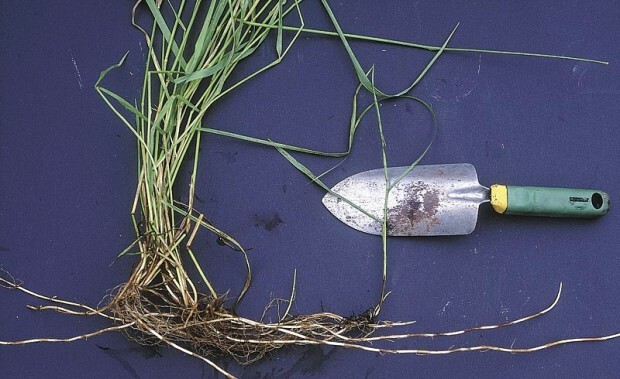 Roots in a dry pocket or dry layer will not move toward moisture. One thing we learn once we know that roots can’t seek out moisture is that root balls of new plants need special attention. A peat-based root ball of a container-grown plant may dry out far more quickly than the garden loam or clay around it. Roots within the peat will simply stop growing. Until a new transplant’s roots have grown beyond the peat and into the garden soil, its root ball has to be checked separately for dryness even if the soil around it is wet. Another corollary of “roots can’t go to water” is that although it may be best when sprinkling many flowers, trees and shrubs to water deeply so that the whole depth of the root mass is wetted, plants with shallower roots need frequent, light watering. Lawn roots shorten in summer heat so a daily application of 1/8 inch of water is better than a weekly watering that means days-long drought in the surface layers. Annual impatiens evolved in rich leaf litter in damp jungles, and have shallow roots too. Water them often, but don’t waste water by applying enough to wet the deeper soil layers every time. Another thing we hear often is that we should water early in the day, not in the evening, so leaves can dry off before night and be less susceptible to disease. This makes sense, reducing the amount of time that fungus-prone leaves are covered in fungus-promoting films of water, but then how does Mother Nature get away with evening and nighttime watering? Thunderstorms and rain showers come when they will, yet the normal state of being for plants in the wild is one of good health—maybe a bit of fungus here and there, but life-threatening epidemics as seen in rose gardens are rare. If water is applied deeply and occasionally to supplement rain—perhaps weekly or bi-weekly—time of day is not so critical as in an every-day automatic system. Occasional watering means occasional openings for fungus infection. Daily late-day watering increases the chances of fungus infection by a factor of seven or more. For some plants, an increased chance of fungus infection may be offset by water’s cooling effect. As temperatures rise into the 90s, many plants stop photosynthesizing because their root systems can’t supply enough water to keep that process running at the high speed engendered by high heat. Pores in the leaf close, shutting off the upward flow of water like a drain plug in reverse. Without water flow, photosynthesis can’t take place, and the plant can’t produce fresh sugars to fuel its life processes. It lives off its reserve starches until the air cools. Dr. Vargas’ ground-breaking studies of turf irrigation clearly show that watering during the hottest part of the day is best for lawns because it cools the air around the grass, allowing it to continue to photosynthesize. Other plants are more susceptible to fungus when exposed to drought or alternating wet and dry. If bee balm (Monarda didyma) that thrives in constantly moist soil is kept dry, its chances of developing powdery mildew are greater. Likewise, lungwort (Pulmonaria species) grown with drought-tolerant bigleaf forget-me-not (Brunnera macrophylla) in the dry shade is more likely to develop mildew than if grown in a constantly moist, well-drained hosta bed. How about all the hype for weeper hoses and trickle irrigation, to conserve water and keep the leaves from ever getting wet? Does it sound like the only good way to deliver water? 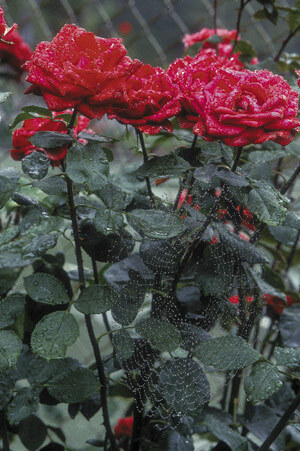 With weeper hoses, we often see increased spider mite damage. Regular rinsing keeps mites in check. Roadside plants struggling with pore blockage and light reduction under a layer of grime become more susceptible to pests unless rinsed regularly. If all this seems too much to keep straight, maybe you haven’t been watered well! Why not go sit in the shade, have a cool drink and think about it? You may see that only one or two of the situations I’ve described here apply to your garden. While the heat’s on and your plants need it the most, fine tune that watering system! The best gardeners develop an eye that takes in the whole plant and garden—not just the flowers. One “star” of this article is evident here to the trained eye. Why are weeds so hard to talk about? We spend much of our in-garden time preventing and removing weeds. Perhaps you haven’t counted those hours, but I have, since I garden professionally and must account for my time. Bottom line? We spend 30 to 35 percent of our gardening hours in pursuit and defiance of weeds. Every weed is a desirable plant for someone, somewhere. Scotch thistle (Onopordum acanthium) is an invited biennial guest in my garden, an impressive eight foot tall, sculptural gray form that provides seeds the finches love. But oh, what a thug it can be, seeding its dangerously sharp self all around! Weed books do exist for those who hunt. My collection, built slowly over twenty years, consists mostly of textbooks and publications from various agricultural universities’ Extension services. Although there is plenty of useful information in “Problem Perennial Weeds of Michigan” (Michigan State University Extension bulletin E-791) and in “Weeds” (a textbook published by Cornell University Press), it’s dry, dry, dry. Worse, the suggested control methods in textbooks and Extension bulletins are mostly geared toward agricultural and commercial users. “Repeated mowing,” “clean cultivation” or “fallowing for one season” might be practical for a farmer, but are tough to translate to the home garden. 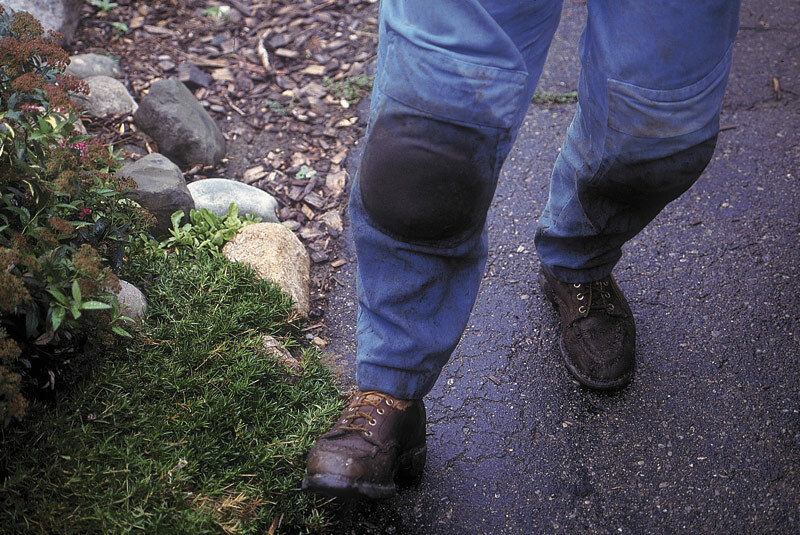 Likewise, a professional landscaper may benefit from the advice “timely spot treatment with the proper herbicide,” but most of us don’t care to know which of the many herbicides available only to professionals would work even if we could buy them because it’s not often practical to apply herbicides in established beds. The attitude adjustment can take time but it’s the ultimate liberation to be able to talk about weeds without shame. It’s a perspective that allows me to smile and say, ‘Every weed in this article and in these pictures is my weed. I grew it!’ My weedy companions in this picture are all annuals: (left to right) lamb’s quarters, lady’s thumb, crabgrass (in my hand), buckwheat (vine), perilla (at my foot), purslane (in my hand) and Impatiens glandulifera. Please note the perilla and impatiens are invited, but self-sowing monsters—weeds, by their disposition. 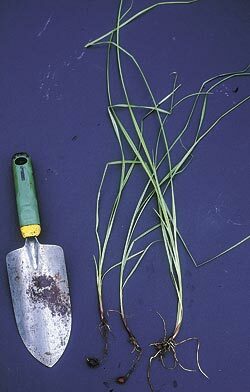 When you see that a plant has running roots that turn up into new plants, like the quack grass (Agropyron repens) has done here in the blade that crosses the trowel, roll up your sleeves! You’re taking on a perennial weed. three-year battle. 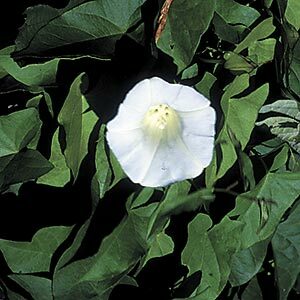 It’s also known as wild morning glory, for its trumpet-like flowers, white aging to pink (here closed on a cloudy day). The more we bring weeding out from under the carpet, the more we can draw on each other’s experience and help. Just think how far ahead we’d be if we shared even a tenth of the tips on weed-beating that we share on rose-growing. Talking more means we’ll also begin to look more closely at our weeds and know them better. 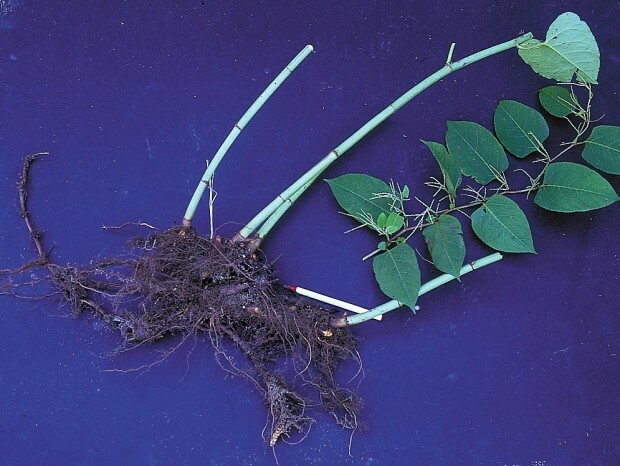 Don’t confuse perennial bindweed with annual wild buckwheat (Polygonum convulvulus, also called hedge bindweed). Notice buckwheat’s flowers are tiny, not trumpets, and its leaves are more sharply pointed than perennial bindweed. 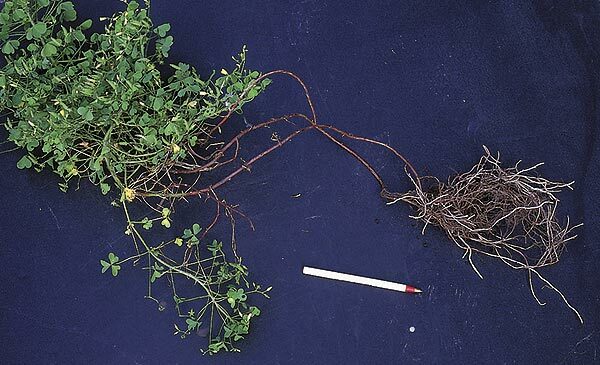 Annual wild buckwheat is far less trouble to beat than perennial bindweed—just keep buckwheat from going to seed. What a wealth of information becomes available when you have a weed’s name. Look it up in the dictionary, check for it in a weed textbook, ask about it at the Extension, type its name into an Internet search engine. In knowledge is power—in this case, power to predict, undermine and eliminate. 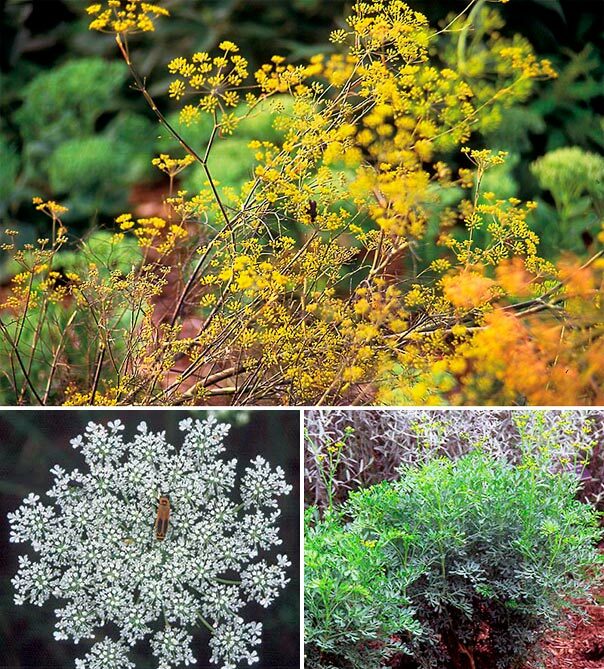 To identify your foes, start with MSU Extension weed bulletins—several include color photos. No luck there? Flip through weed textbooks at a library. Still nameless? Press a sample of the weed, preferably with root and flower or seed pod intact, sandwich it between sections of newspaper and stack heavy weights on it for a week. Tape the flattened sample onto cardboard and take it to garden centers, garden club meetings and plant swaps. Someone will give you the name. Even before you know your pest’s proper name you can start working on the next most important fact—is it a perennial, annual or biennial? 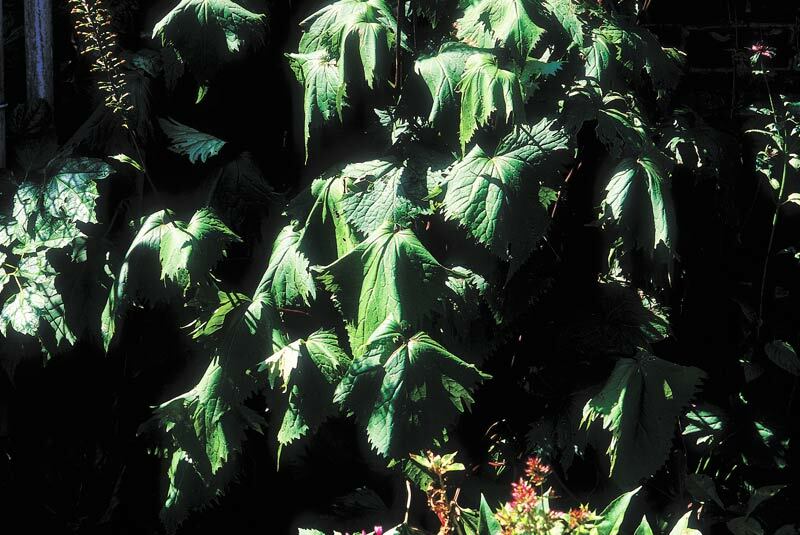 Many perennials reveal their long-lived nature through their roots. Loosen the soil all around the weed and remove it carefully, roots intact. Look for underground runners that pop up into new plants, or bulges and knobs on a horizontal root that foretell new shoots. The presence of storage organs such as bulbs and tubers are also telltales that the plant’s either perennial or biennial. There’s no other reason for a plant to store away a lot of starch except that it’s planning to come back next year. Ground ivy (Glechoma hederacea) is a tough perennial weed, rooting wherever it touches soil and ducking so nimbly in and out of lawn and groundcover that the whole area usually has to be killed and started over. Which brings me to another “must-do” when it comes to weeds. That’s to stop looking for miracle techniques and products. 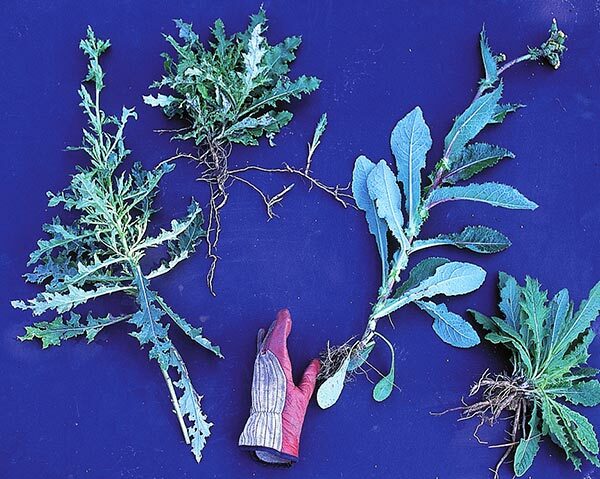 Weeds caught early on, under two inches tall, can be dispatched fairly easily with a hoe or a smothering mulch. Give them a year and you’re in for a battle that requires a discriminating eye and lots of hand work. I’m not saying I like this fact. Established perennial weeds make me cringe. That’s what’s wrong with the lead picture in this story. See that Canada thistle (Cirsium arvense) among the hostas on the left? Okay, go after it. Loosen the soil, remove every bit of root you can find. 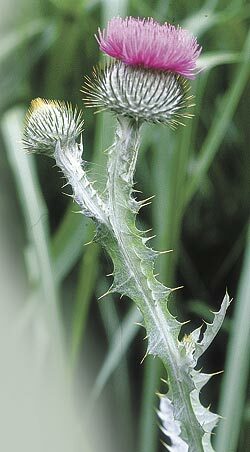 Then acknowledge the root’s depth, brittleness and tenacity by returning every week or ten days for two whole seasons, April through November, to nip off every bit of thistle that tries to make a comeback. At the end of the second year, you may have starved it out—forced it to exhaust all the reserve starch in its roots. Tuber roots are what make yellow nutsedge (Cyperus esculentus) such a scourge. Those in the know understand that if you don’t get the nut out, you don’t get the sedge out. Perennials and biennials can stash an amazing amount of starch in their roots, given even a bit of green leaf to work from. Take a carrot (Daucus carota) in its weed form: Queen Anne’s lace. It’s as cute and small as a carrot-top in its first year – just a bunch of low, feathery leaves. Yet look what the root produced by those leaves delivers in year two—four feet of stately stem, leaf, flowers and thousands of seeds. No wonder when we leave a bit of weed root in the ground, it manages to keep sprouting for years. Bindweed (Convulvulus arvensis) is worse. Given time to establish, its roots may dive 15 feet deep. If dug well and then nipped in the bud every six days—more frequently when the growing is good—it takes 2 to 3 years to wear it out. 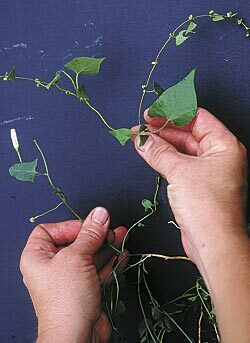 Don’t confuse hedge bindweed (Polygonum convulvulus, also called wild buckwheat) with perennial bindweed. An annual, wild buckwheat is far less trouble to beat—just keep it from going to seed. That means where blown-in seed or seed-infested mulch spawns an invasion, weed thoroughly several times before mid-June. Scouring rush or field horsetail (Equisetum arvense) drives people crazy yet it’s a wimp compared to bindweed and Canada thistle. Dig it well, focusing on those enlarged tuber roots, keep new shoots nipped weekly for one season and it’s gone. New weeds show up all the time. Some pretend to be something planted on purpose, as this one did. When it reached eye level I decided I didn’t plant anything new that would be so big, and yanked it. We took this photo for posterity. I’ll use it to figure out what it was! Tuber roots are what make yellow nutsedge (Cyperus esculentus) such a scourge. Pull on this weak-looking, creased-blade grassy creature and it comes readily, with what looks like all roots intact. Those in the know, however, understand that if you don’t get the nut out, you don’t get the sedge out. Yellow wood sorrel (Oxalis florida) is another perennial that fools us by pulling easily and seeming to have little root. That’s because its running roots break loose and stay behind when we pull—a good reason to study the plant, learn that it has runners and loosen the soil well throughout the area before pulling. Obviously, we can’t cover all weeds and weeding techniques in this article, but this is a good start! Learning the flip side of bloodroot (Sanguinaria canadensis) means employing a tactic that also tends to save the plant in the long run. Dividing bloodroot reveals its secret and yields divisions to carry on even if the mother clump falls to fungus. Do you give your garden’s flip side any attention? The flip side of pearly everlasting culminates in a show of lovely orange butterflies marked black, blue and white. 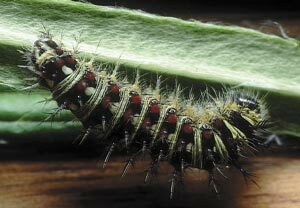 Its caterpillars give a preview of the color that will come, if only the gardener is tolerant of their presence and some tattered foliage. Most of the time the flip side got little play. However, the song on the flip side of a 45 was ocassionally a delightful find. Plants and gardens are that way. Although we buy or grow for an “A” side—that certain shape flower, a particular fragrance, or a rich fall color—we ought to give flip sides a play or two. They’re good for a laugh and sometimes for longer term enjoyment, but even if appalling they are enlightening. Pearly everlasting (Anaphalis margaritacea) is a sturdy native perennial of sunny, sandy places that opens white nubbin flowers in dense clusters in August. The flowers dry in place—thus the moniker “everlasting.” The plant’s downy gray foliage gets little special attention, except when invaded by tiny “worms” in May. 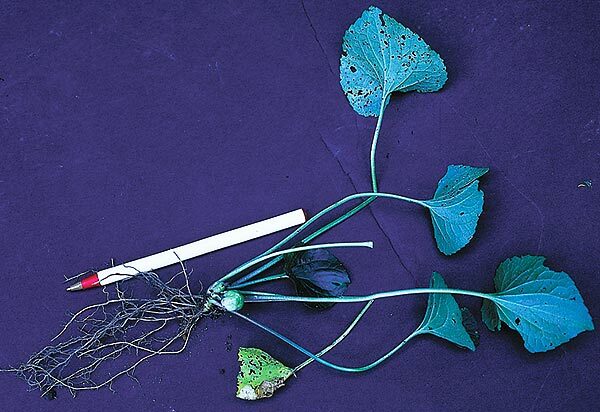 These knit together and despoil the leaves at the tips of stems, alarming and disgusting most gardeners—unless they’re given a bit longer play. If you hold off on the insecticides, the “worms” can be quite entertaining. Small, dark and creepy at first, as they grow they become recognizable as the larvae of the American painted lady butterfly. Experience teaches that they will finish feeding sometime in June and depart to pupate, at which point a well-established pearly everlasting will grow over its tattered tips and bloom without concern at its normal time. Given their long evolutionary gig together, it shouldn’t be surprising that insects are often present on a plant’s flip side. 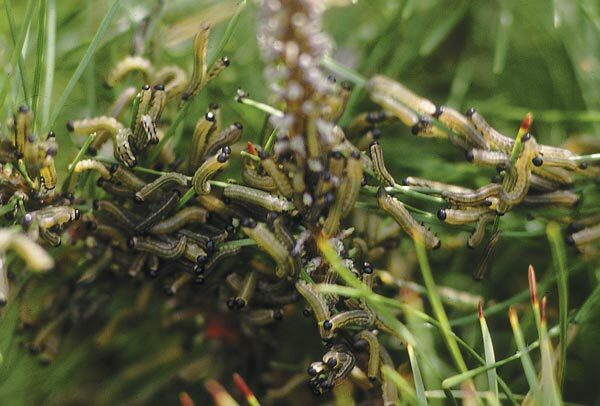 View pine sawfly as a disgusting flip side to mugo pine and Austrian pine, enjoy their lively dance routine. Pine sawfly on a mugo pine is a “B” side that can disgust a gardener. Given just occasional play, though, sawflies have a certain charm. First, there’s the way they emerge from the eggs on the needle, a perfect row of bumps on the needle’s underside. Sometime in May the caterpillar-like sawflies pop out in close-coordinated sequence. The needle becomes a stage for a chorus line of tiny acrobats which first hang down, then flex and flip themselves topside to begin a few weeks of feasting. If not blown away by a forceful stream of water or insecticidal soap during their debut performance, they grow to show the tolerant observer yet another dance number. By mid-June a sawfly gang is clustered below the new growth, each member as long as and colored much like the needle on which it feeds. Even the preoccupied gardener notices the act at this point and pauses to look more closely. The colony’s response to this close inspection is a uniform twitch and freeze. There is no way to save or replace the needles by this time. Once the needle-imitating sawfly larvae depart, plummeting to the ground to pupate in the soil by next spring, that stretch of stem will be bare. I usually squash the group and clip the affected stem back to a side branch, but not until I’ve given the group my eye and a bit of direction, moving my hand close and then away to choreograph the twitching motion. I wonder that someone hasn’t videotaped and exploited this performance—it’s just begging to be set to music. People and plants have a long history, too, so that human interaction with a plant becomes part of its flip side. 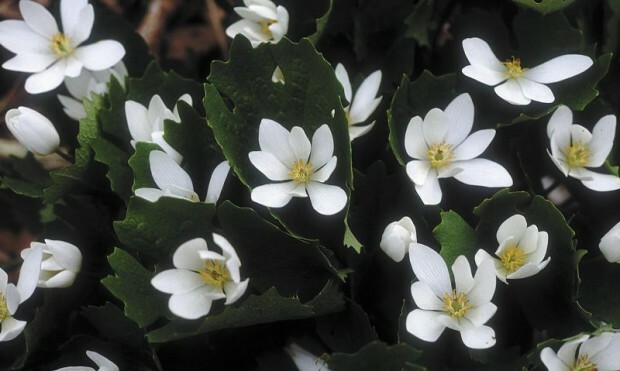 Bloodroot (Sanguinaria canadensis) is understandably well known for its charming “A” side, brilliant white flowers at first protectively folded into and then proudly displayed among mitt-like gray green leaves. Its flip side somehow escapes notice. Next time you divide a clump of bloodroot—you should do this every few years as a defensive tactic because clumps are known to succumb suddenly and totally to root- and crown-destroying fungi—break a bit of root and you’ll see the flip side in the orange sap that oozes out. 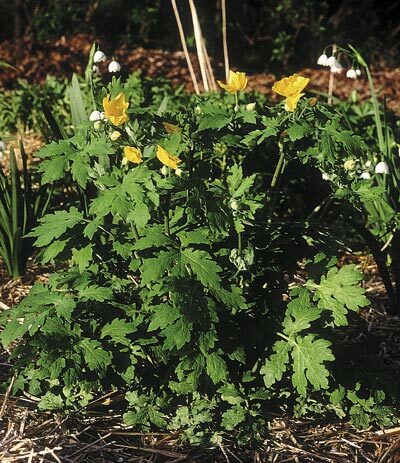 Celandine poppy (Stylophorum diphyllum) is a showy addition to a shady garden, with a sappy flip side. The sap of celandine or wood poppy (Stylophorum diphyllum) is a flip side too. 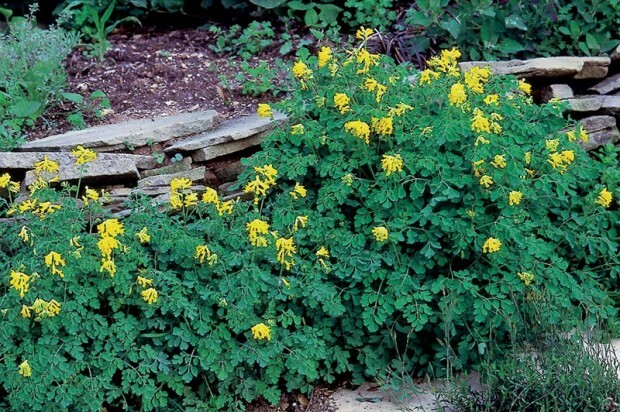 It’s valued for its “A” side in a shady garden, bright yellow flowers in spring and early summer. Its “B” side is there to be discovered all season—a plucked stem can yield enough bright yellow-orange sap to write out a word or two. Harmless, temporary dye. It’s said that the great garden designer Gertrude Jekyll would write notes to herself in celandine sap. The “A” side of prairie coneflower (Ratibida pinnata) is apparent in July – a wind-generated bobbing and weaving of its yellow-petalled flowers that might be titled “Dance of the Golden Shuttlecocks.” The flip side should bear the name “Lean on Me,” since that’s the act that follows when the plant is placed as nature intended, among tall grasses. 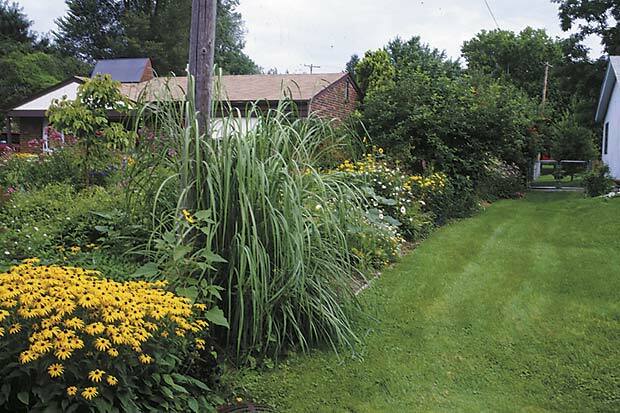 Without the accompaniment of grasses or other sturdy neighbors, the flip side can be a bother, however, requiring tall, carefully placed stakes. I’ve seen the flip side in a different version though, one so arresting that it literally changes the “A” side. Knowing that the 4- to 5-foot stems will splay in July but wanting to avoid staking, a gardener can play that flip side early and to advantage. In May, pull the stems down and away from each other and use bent wire to staple them to the ground in a sunburst pattern. The stem ends and the side branches will all turn upward then, growing to produce a spoked circle of half-height, self-supporting shuttlecocks. 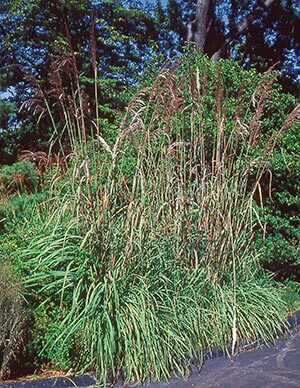 Providing other plants a strong shoulder to lean on, ornamental grasses play a “B” side that should be a hit in any garden. Few plants have such a supportive nature as ornamental grasses. They provide neighboring plants with a windbreak in summer, and perform the same service for birds in winter. Ornamental grasses have quite a motherly tone to their flip side. Besides acting as support for tall prairie flowers, they serve as windbreaks for other plants and animals too—pay attention and you’ll notice butterflies and birds taking shelter on the lee side of a dense grass on blustery fall or winter days. It can’t be denied that butterfly bush’s showy flowers and accompanying butterflies belong on the top ten list. But its “B” side as a natural staking system ought to get more play. Butterfly bush’s (Buddleia davidii) flip side is supportive too. Delphiniums or cosmos grown within its spread can take advantage of this to thread their way up and then stand securely between the stiff branches. Romantic blue monkshoods (Aconitum species) are certainly sinister on their flip side. It pays to know that eating even a little part of the leaf, flower or root can be deadly. It seems to have been part of some Roman armies’ scorched earth tactics to poison water supplies with monkshood, preventing enemy use of those resources. Common milkweed (Asclepias syriaca) has a playful flip side. 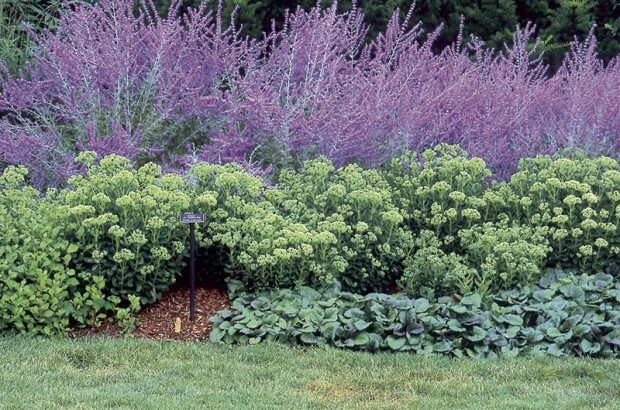 The foliage is well known as Monarch butterfly caterpillar fodder and the hemispherical clusters of pale purple flowers add color and fragrance to a wild garden. But watch a butterfly sipping nectar from an individual flower in that purple globe. 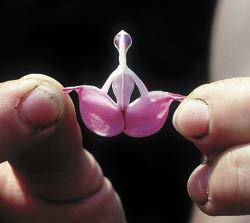 Notice that the close-set ring of upward-facing petals parts easily and the butterfly’s foot slips in. The ring then closes tightly, forcing the butterfly to yank-step, as we might labor to reclaim our foot from deep, sticky muck. All of the milkweed plants play this game. I can’t help but think there were other ways to insure that a pollinator’s foot came into contact with pollen, but this group of plants have a character that prefers to work by practical joke. The “B” side of every plant is there to be observed, or it can be discovered while exploring plant encyclopedias for word of your garden favorites, or you might just piece it together over time from conversations like this between gardening friends. Dig a little deeper into your garden’s flip side this year for the fun of it, for a mind-expanding game, or to learn more rewarding ways to grow and use your plants. Rejoice in clay, the choice of many fine plants. Roses and crabapples, plus rarer beauties like Rodgersia (above) thrive in a loose clay-based soil. Ah, spring! The season of new life, warm earthy scents, and fresh starts on gardens! Unfortunately, it’s also a season of miracle products—powders and potions claiming to “break up heavy soil,” “dissolve clay,” “ionize damaged soil,” etc. Twenty-five years of gardening in soils throughout southeastern Michigan, around homes new and old, has taught me that only one ingredient can be added to hard soil to make any real difference in its garden potential. Air is that magic ingredient. You’re right, for the wrong reasons. You feel that stuff made the difference, but I know that mixing was what worked wonders. The digging allowed air to flow through the soil. Air brings water with it. Water doesn’t fall into soil, it’s pulled in by capillary action, a draw that exists only if there’s air moving freely in pore spaces in the soil. Abundant, moist air fuels an explosion of life between the soil particles. Microorganisms and soil animals increase geometrically in aerated soil. These creatures’ chewings, manhandlings, regurgitations, excrements, and other life processes transform solid soil minerals into forms which can be imbibed by species restricted to liquid diets—plants. Clay in soil is not terrible. When the tiny bits of mineral called clay are numerous, that soil offers far more nutrients and holds moisture far better than one that’s mainly sand. Compaction is what’s terrible – the state soil takes after pressure has been applied, usually by earthmoving and grading equipment. Even a farm’s best sandy loam can be packed down so hard that the average gardener will cry “clay!” and begin seeking wonder products. Left: Don’t worry about planting among still-whole chunks of clay. Plant alongside them or break them in half and fit them, plus decaying mulch around the new root balls as backfill. Right: Use a garden fork to loosen the bed. In a compacted soil, air spaces have been squeezed closed. Crumbs of combined clay, sand and humus have been pulverized – crumbs that once gave the soil an airy, root-friendly structure. Separated by crumb-busting, the component particles settle into dense layers. They will not re-form into crumbs until treated with that mix of worm spit, fungal strands and bacterial residues called microbial glue. 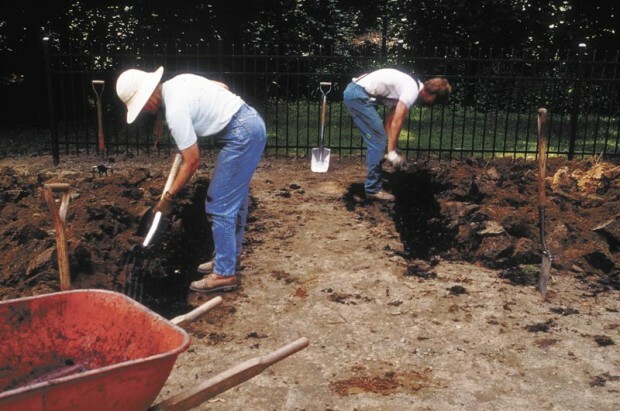 Pressed down and airless, compacted soil can’t attract or support many worms, fungi or bacteria. Thirty years after being graded with heavy equipment, such a soil will still be dense and lifeless unless physically broken and aerated. Worms should be considered a gift. They move into the cool, moist mulch and dine on the leafier organic matter. Between meals they burrow into the moist clay, dragging organic matter with them and depositing worm manure (casts) along the way. So can anything be done with the miserable leavings called soil on your property? Certainly. However, there is no immediate fix unless you can afford wholesale excavation and replacement. Here’s a much less expensive option that trades time for money. This spring, start some soil-loosening by wetting the soil. Since pore size in hard-packed soil is small to non-existent, it takes a long time for water to infiltrate. So cover the soil with porous mulch to encourage water to “sit” and “stay.” Wood chip mulch is fine, but pine bark is best for reasons explained later. 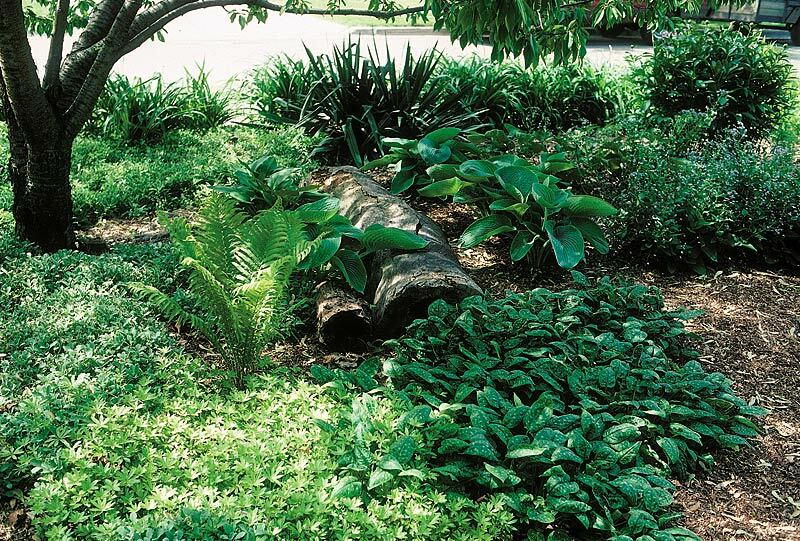 Layer the mulch with grass clippings if you can—more on that later, too. Keep the area well watered throughout summer. with hard-packed soil than a gardener in tennis shoes. 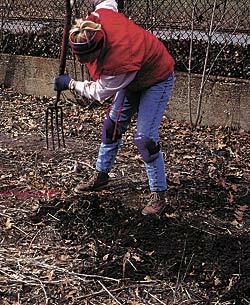 In late summer or early fall rake off the mulch. Use a garden fork to loosen the bed. Insert the tines as far as you can, lean back on the handle and pop a chunk loose. No need to lift the chunk out of the bed, just pop it far enough that it doesn’t settle back level with the undisturbed soil. Move over one fork’s width, insert the fork and pop again. Continue doing this row by row through the garden until the whole surface is lumpy. Add one of those miracle products now if you’d like. Scatter or sprinkle it over the area and water it in well. Me? I’d rather use that money to add compost. Re-cover the area with mulch. Add more grass clippings or leaves that are small or shredded. Water. Wait some more. What’s going on while you wait is, well, life. Worms move into the cool, moist mulch and dine on the leafier parts. Between meals they burrow into the moist clay, dragging organic matter with them and depositing worm manure (casts) along the way. Other soil animals follow these trails, which is why worm burrows often contain a soil’s greatest diversity of species. After the first waiting period you were able to loosen previously-impenetrable soil to a depth of 8 or 9 inches because the worms led the way. Now the worms will go even deeper. Many plants enjoy loose, clay-based soil, including roses. During the waiting periods, some of the organic matter that is dragged into or falling down worm burrows is decaying bark. That’s good, especially if it’s pine bark with its high lignin content. Lignin, partially rotted, lasts a particularly long time in the soil and each bit becomes a nucleus for soil crumb formation. After a year, in spring, the bed is ready for planting. Don’t worry about planting among still-whole chunks of clay. Don’t remove them, either. Just plant alongside them or break them in half and fit them, plus decaying, mulch around the new root balls as backfill. Roots will follow the crevices between clods, making fibrous nets over every moist, rich clay surface—nets which hasten clay’s crumb-ling. Here are three ways to take some of the labor out of this process. One, drill rather than dig. Use a soil auger or rent a power posthole digger. Punch holes in the clay every 12 to 18 inches rather than loosen with a fork. Let drilled soil fall back in and around each hole. No need to backfill the holes with “good” soil because the drill adds the only necessary magic—air. Two, if you have a heavy-duty lawn tractor or can hire a farm-grade tractor and operator, knife the soil rather than fork or drill it. A soil knife attachment slices the soil vertically, cutting about 18 inches deep. The soil doesn’t turn over, as with a plow, it just parts. Knife the soil in rows 18 inches apart. Go over the area twice, first in rows parallel to any slope, then up and down the slope. Sorry—don’t try drilling or knifing if you have buried utility wires, pipes, or sprinkler lines in the area. Your third out is to moisten the soil with watering and mulch, fork it lightly, then build a raised bed of imported soil on top of it. Don’t, however, skip the forking. Many raised beds over clay fail because there is no transition area between the two soil layers. Water pools there, unable to penetrate the clay as quickly as it ran through the top layer. Roots rot. Finally, if your soil really is clay, be happy with that. Clay soil is the choice of many fine plants. Common species like roses, lilacs, iris and crabapples plus rarer beauties like Rodgersia and Ligularia thrive in the loose, clay-based soil.